Luggage capacity: 1900 cubic inches total. 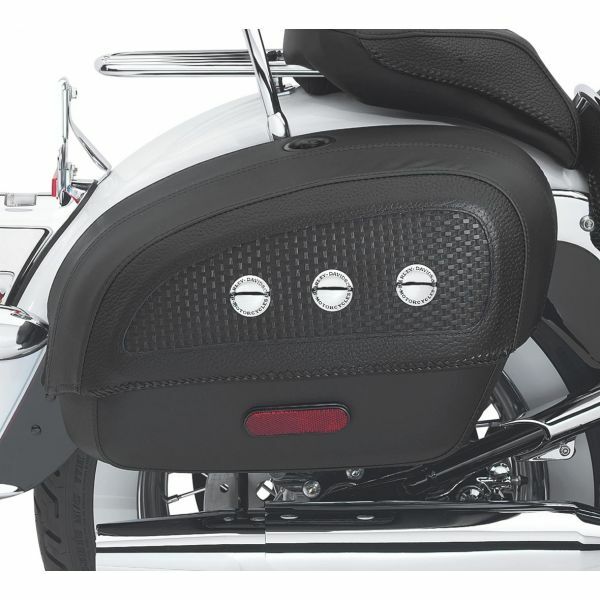 Styled to complement the nostalgic look of the Softail Deluxe model these saddlebags with pleated leather panels are anything but traditional. The rigid core allows the bag to retain its shape even after years of use. The hinged locking lid tilts outward for easy access and the embossed weave pattern braided edging and chrome concho trim echo the Softail Deluxe seat and pillion for a coordinated look. Fitment: Fits ’05-later FLSTN models. Does not fit FLSTNSE. Does not fit with Rear Axle Covers.